Virtual Macedonia Forums The Largest Macedonian Forum - Socrates/Euthyphro: What is Piety? In the Euqufrwn (Euthyphro), for example, Socrates engaged in a sharply critical conversation with an over-confident young man. Finding Euthyphro perfectly certain of his own ethical rectitude even in the morally ambiguous situation of prosecuting his own father in court, Socrates asks him to define what "piety" (moral duty) really is. The demand here is for something more than merely a list of which actions are, in fact, pious; instead, Euthyphro is supposed to provide a general definition that captures the very essence of what piety is. But every answer he offers is subjected to the full force of Socrates's critical thinking, until nothing certain remains. More significantly, Socrates generates a formal dilemma from a (deceptively) simple question: "Is the pious loved by the gods because it is pious, or is it pious because it is loved by the gods?" (Euthyphro 10 a) Neither alternative can do the work for which Euthyphro intends his definition of piety. If right actions are pious only because the gods love them, then moral rightness is entirely arbitrary, depending only on the whims of the gods. If, on the other hand, the gods love right actions only because they are already right, then there must be some non-divine source of values, which we might come to know independently of their love. In fact, this dilemma proposes a significant difficulty at the heart of any effort to define morality by reference to an external authority. (Consider, for example, parallel questions with a similar structure: "Do my parents approve of this action because it is right, or is it right because my parents approve of it?" or "Does the College forbid this activity because it is wrong, or is it wrong because the College forbids it?") On the second alternative in each case, actions become right (or wrong) solely because of the authority's approval (or disapproval); its choice, then, has no rational foundation, and it is impossible to attribute laudable moral wisdom to the authority itself. So this horn is clearly unacceptable. But on the first alternative, the authority approves (or disapproves) of certain actions because they are already right (or wrong) independently of it, and whatever rational standard it employs as a criterion for making this decision must be accessible to us as well as to it. Hence, we are in principle capable of distinguishing right from wrong on our own. Thus, an application of careful techniques of reasoning results in genuine (if negative) progress in the resolution of a philosophical issue. 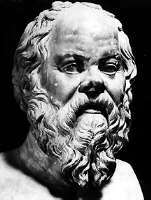 Socrates's method of insistent questioning at least helps us to eliminate one bad answer to a serious question. At most, it points us toward a significant degree of intellectual independence. The character of Euthyphro, however, seems unaffected by the entire process, leaving the scene at the end of the dialogue no less self-confident than he had been at its outset. The use of Socratic methods, even when they clearly result in a rational victory, may not produce genuine conviction in those to whom they are applied.